From the foregoing discussion it is clear that labour laws are identified to be the major reason for the slow growth in employment in the organised sector. It is further contemplated that the labour laws contribute to form a dual labour market, producing a minute constituency of labour aristocracy at one end with a vast majority of working paupers at the other. Therefore, to generate quality employment and remove the distinction between formal and informal workers, it is argued that India must introduce LMF. In what follows we shall examine the validity of these claims. Immediately the question arises, is it correct to ascribe the failure of the organised sector as a whole, in generating formal jobs, primarily to the rigid labour laws? A close reading of the domain of application of Chapter VB (IDA, 1947) reveals that it applies to only manufacturing units, mines and plantations – and not to firms providing services or, related to agricultural activity. However, firms employing 10 or more workers qualify for the ‘organised’ sector irrespective of their nature of activity (Indian Labour Year Book, 2007 p.2). 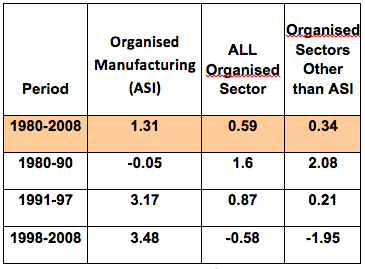 As figure 1 shows that the share of organised manufacturing sector workers [where restriction on firing workers applies; data obtained from Annual Survey of Industries (ASI)] in total organised workforce has been persistently below 30 per cent for the whole period under study (except for the last year, 2008-09). Source: Data on Organised Manufacturing Sector from ASI, various years and Total Organised sector employment data from DGET, various years. However, from the discussion just carried out it is clear that job security regulation applies only to a subset of the total organised sector namely, organised manufacturing sector (constituting less than 30 per cent of total organised workforce) and does not extend to the organised sector as a whole. Therefore, it is patently wrong to identify the labour laws for explaining the slowdown in employment growth of the overall organised sector – since employment protection laws apply to less than a third of the total organised workforce, namely organised manufacturing sector. Next we look at the employment trends in different segments of the total organised sector and compare it with the organised manufacturing sector. For this refer to table 1 below. The second column depicts the growth rate of employment in the organised manufacturing sector i.e. where labour laws apply. In the third column employment growth of the organised sector as a whole (including organised manufacturing) is calculated. Finally, the last column shows the growth rate of employment in the organised segment (excluding organised manufacturing). It is easy to see from the table that in the long time period [i.e. 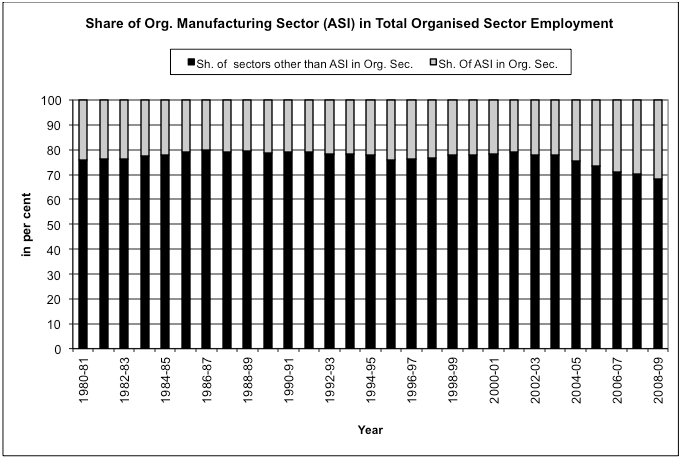 1980-2008] the employment growth in organised manufacturing sector (where labour law applies) is greater than both the organised sector as a whole, as well as, the section of organised segment other than organised manufacturing. This holds true for the sub-period analysis except for the sub-period 1980-1990. Thus, it may be concluded that the organised manufacturing sector (where the law stipulates firms to take prior permission for firing) actually boosted the employment growth in the overall organised sector (other than the sub-period 1980-1990) rather than pulling it down. Thus, there is little evidence to suggest that the slowdown in employment growth in the organised sector as a whole was due to the labour laws. [Sluggish growth in overall organised sector employment is actually explained by the failure of the public sector to generate formal jobs – a direct fallout of the conscious policy decision by the State. In fact there is also evidence on employment growth being higher in those segments of organised manufacturing where labour laws apply compared to where it does not apply (for a discussion on these issues see Roychowdhury, 2013)]. Now we turn to the question, whether labour laws produce duality in the labour market by creating a small group of labour aristocracy located within a vast pool of informal workers. The basic argument is quite simple – labour laws by extending protection of employment increases the bargaining power of workers, which in turn is utilized by them to jack up wages. As Ghose (1994) puts it – “A popular perception in India today is that rising labour costs [i.e. wages], [are] attributable to labour market rigidities generated by inappropriate [labour] regulations …”. On the other hand, since informal workers are not protected by labour laws – their wages remain low. Note that in this argument one section of worker is pitted against another section; with an attempt to deviate our attention from the class distribution of income. Now if workers, armed with employment protective legislation, could raise their wages due to enhanced bargaining power then we would expect the share of wages in total output [gross value added (GVA)]to progressively rise overtime. However, from figure 2 it is clear that the available evidence is at odds to substantiate such a claim. There is almost a secular decline in the share of wages to output – in fact the wage share in organised manufacturing has come down to less than 10 per cent in the most recent years. So, if wage share is taken as an indicator of the relative bargaining position of labour vis-à-vis capital – it is clear that the bargaining of the workers weakened over time, even in a sector where labour is statutorily protected by law. To be sure, workers in the informal sector might have received an even more raw deal, but the whole point is the position of the organised manufacturing workers deteriorated as well. By no means can the organised manufacturing workers (with a wage share of less than 10 per cent of GVA) be demarcated to constitute a labour aristocracy. One can argue a little further. There is evidence of increase in informal employment within the organised manufacturing sector. Remember, the law requiring prior permission from the government for carrying out retrenchment and layoff applies only to permanent workers and not to the workers employed through contractors (contract workers). And we find that the share of contract workers in total workers has increased consistently over time (figure 3). 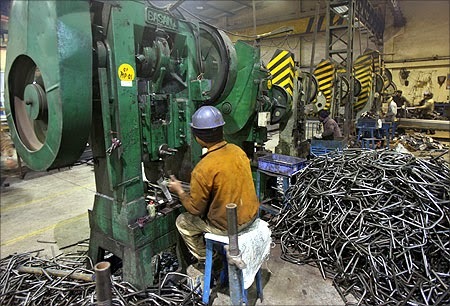 By now it is one-third of the organised manufacturing employment – precisely the sector where labour law applies. Thus, any claim of labour aristocracy in midst of rising informal employment is premature. From the above discussion it follows that none of claims normally advanced in favour of LMF can be logically sustained. Nonetheless, undertaking LMF has far reaching implications. It is easy to see that the demand for labour flexibility, by invoking the labour aristocracy argument is actually a strategy to divide the working population. By inventing the conflict of interest among different segments of the working population, LMF actually wants to further the interests of capital vis-à-vis labour as a whole. In fact to introduce LMF for rapid growth in ‘quality’ employment is a contradiction in terms; this is so for once LMF is introduced, ‘quality’ itself is degraded. Similarly, appealing to the labour aristocracy argument is inverted logic; if a small section of working population is better off than the vast majority of the working poor, then in the quest for obtaining a homogeneous workforce, we must search for strategies to improve the conditions of the informal workers rather than worsening the position of the formal workers. Debroy, Bibek (2005), ‘Issues in Labour Law Reform’, in Bibek Debroy and P.D. Kaushik, ed., Reforming The Labour Market (New Delhi: Academic Foundation). Ghose, Ajit K (1994), ‘Employment in Organised Manufacturing in India’, The Indian Journal of Labour Economics, Vol. 37 No. 2: 143-162. Indian Labour Year Book (2007), Labour Bureau, Ministry of Labour, Government of India. Roychowdhury, A (2013), Labour Market Flexibility and Conditions of Labour in the Era of Globalisation: The Indian Experience, unpublished Ph.D thesis submitted to Jawaharlal Nehru University, New Delhi. Sundar, K. R. Shyam (2005), ‘Labour Flexibility Debate in India: A Comprehensive Review and Some Suggestions’, Economic and Political Weekly, May 28: 2274-2285. The author is faculty of Economics at St. Stephen’s College, New Delhi. The reason behind the collapse of organised manufacturing employment in the sub-period 1980-1990 is not due to labour laws but the way ASI enumerates workers and the underlying nature of technical progress (notably labour saving variety). For details see Roychowdhury (2013).